Last edited by HiddenX; January 28th, 2018 at 18:11. LOL, people hating DOS2 are throwing a tantrum there… priceless. D:OS 2 is not as big a surprise for me as Prey. 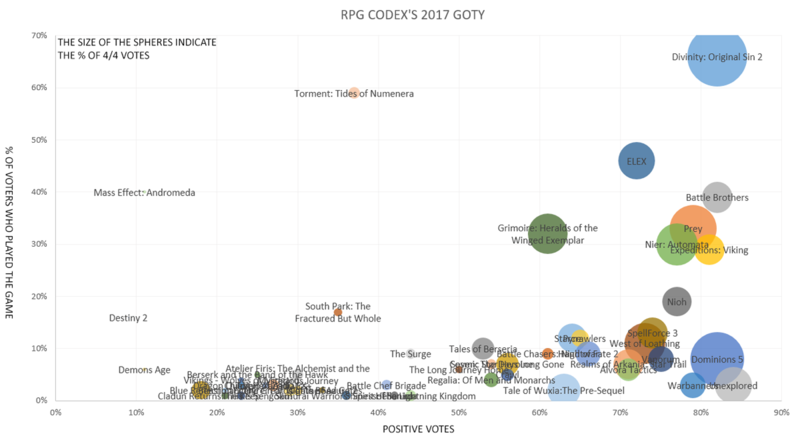 For the RPGCodex its a very mainstream list. Hardly surprising considering Codex regulars don't have a reputation for being the most level headed, respectful and mature crowd. I haven't played it yet, but Prey doesn't really look like a RPG. It is supposed to be a good game, but RPG is streched a bit far. The mainstream appearance of the Codex voting is likely due to the fact that everybody was able to vote, registered or not. D:OS2 is certainly the best RPG I played last year and I continue to play it. 154 hours logged so far and running one single-player game (still messing around in 2nd area) and running a multiplayer game with friends. Once I finish, I plan to start modding. This might end up as my game of the decade, when all is said and done. I wanted to like The first Original Sin, but it was too linear and Diablo-like for me. Couldn't stand the loot system and the fact that half the game was spent running back and forth between vendors. But I can see how some (many) loved it. I'm giving the sequel a pass. It seems to have a number of die hard fans and haters. Personally its on my wish list, and having read the Codex review, I thought a balance patch and manual would be the prerequisites for my purchase. Since neither have appeared, my money remains in my wallet. The game's rating has taken a beating over the months as well slowly going from positive to mixed as little has occurred since the month long flurry of post release patched. I had fun with it without the manual, there's a load of info available on the web (although some of the mechanics remain opaque - to me at least - so it will be helpful if it ever does appear). There were a few balance patches early on but he's still talking about a big incoming patch (and it needs it), so probably worth waiting for that….but not holding your breath of course! I'm surprised to see it down in 12th in any case, I thought it deserves to be higher. But that's the fun of polls I guess. I tried getting into the first DOS and I found the writing so irksome and cheesy that I had to give up (and I did like Divinity 2). The puns in DOS 1 are just painful. DOS 2 is so much better in that respect it's no longer an issue so if you're like me I would suggest giving it another chance. Someone needs to have a word with the Codex charting dept. That thing's mostly illegible. I really enjoyed the first Original Sin, and couldn't stand the second. I finished it, but doubt I'd ever replay it. The result that surprises me is that Path of Exile. Isn't that an online game? Give it a try if you see it on a sale or something. I could not finish the first city of the first because of the writing, the back and forth without any good reason and so on .. The 2 is a massive improvement on everything and could be well worth your time.